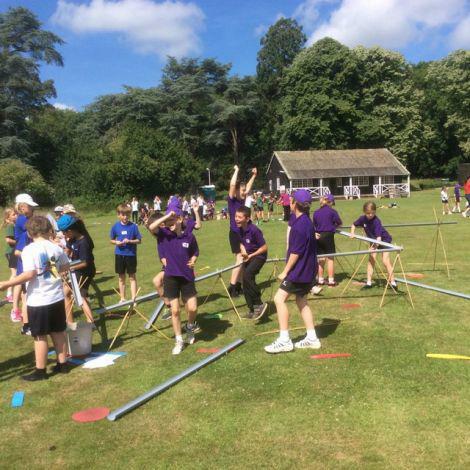 On the 25th of June Stogumber Class 2 went to Norton Manor Military Base in Pen elm to have a packed day full of sporting activities. We started the day with a good game of Roller Ball; the aim of the game was to make a course that rolled a ball into a bucket before the other teams. We worked as a team to build some tri-pods from bamboo and lay bits of piping on top. Then, all we had to do was… ROLL THE BALL!!! We learned resilience in this game because it kept falling down and we just had to keep on rebuilding it again and again. We succeeded in the end. Then we had a game of orienteering. The aim of this sport was to find flags with hole punchers attached to them so that we could stamp a sheet with lots of little squares at the bottom. We had to choose to go through the woods or the main army base, navigating with a map to find the flags. We developed our mapping skills and learned that it’s always better to do your own navigation rather than follow other teams because they can lead you in the wrong direction. Summer and Chloe were amazing orienteers because they stamped all their boxes and returned to base first! After feasting on our lunches, Class 2 started to play capture the flag. 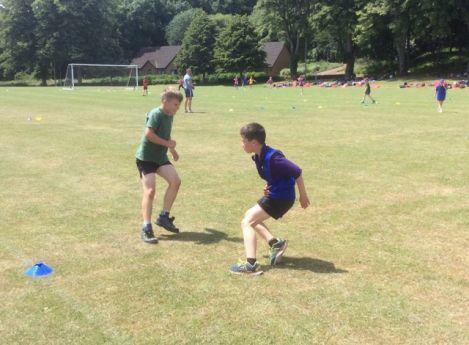 On our team, the year 5s had a secondary school young leader with them and so did the other teams. Our leader was called Mason and he was a really good defender. Striking was hard but at least we had great defenders and runners otherwise we would of probably lost. It took us 4 games to figure out our best tactic but in the end it was up to us. With 10 seconds remaining Issy, Rocco, Leon, Mason and Ashley ran into the purples' quarter and snuck past them. We got the flag in the nick of time! Just after, the ref blew his whistle. We were one of the only schools that won by capturing the flag. A biathlon consists of two sports put together. The two sports we had to compete in were archery and cross country. When we scored three shots on target the team had to run a lap and the team with the most laps when the time ran out was the contest's winner. Our Year Sixes scored seven laps, joint first with Bishops Henderson school, with our Year Fives in a close second place with six laps. Some teams cheated by cutting corners on the lap, but we tried our best to be honest. Thanks to SASP and the marines it was a really great day. Our teamwork has really improved from doing these games and one person who really shone and gained 2 stickers from Mr. Wedderkopp was Ashley (for self-belief and for honesty).